We normally advise seeing a car you are interested in personally before getting an inspection arranged (obviously this is not always possible if you are based overseas or just don’t have the time). This is so you can satisfy yourself that there are no glaringly obvious defects, the colour and specification are to your liking and the seller seems like the trustworthy type. Usually a deposit is placed to secure the car, subject to the results of the inspection. You get in touch by email or phone and we will contact the seller to arrange a mutually agreeable date for the inspection and confirm to you by email once the appointment is set up. We aim to complete the inspection within 5 working days of your instructions, (though this may not always be possible during particularly busy periods). The inspection itself usually takes 3 hours to complete and covers around 230-points including the car’s basic documentation, body condition (including assessing the body with an electronic paint thickness gauge to find any repaints, evidence of filler, damage and repairs). Modifications, mechanical (non-intrusive) inspection of the engine, gearbox, suspension (leaks, perishing deterioration) and the basic function of the electrical systems and accessories. We check out the condition of the interior and compartments in detail, assessing wear and tear, accidental damage and non-function of equipment. We lift the car safely using jacks and stands (if no ramp is available) to allow us to get right under the car on a variety of surface qualities. We assess any oil leaks, the wear and tear items like brakes, tyres as well as the cosmetic items such as underbody plastic trim, underseal breaks and corrosion. On the later models, we are also particularly sensitive for any visual signs of premature mechanical engine faults. We use a Porsche (PIWIS) diagnostic computer on the car (if relevant) and review the ECU data. The data will also show us any over-revving of the engine and also any electronic system fault codes and, dependent on the model, the ECU mileage (less easy to 'adjust' than the odometer display). If the car is being sold from a non specialist dealer or private seller these checks are particularly important. We carry full trade motor insurance and trade plates that covers us to drive test the car. As we offer a mobile inspection service, where we are working for you rather than the car’s owner, we do not dismantle major items from the car during the inspection (although we do take out the front compartment trim to inspect the car’s frontal structure & remove engine covers on some Boxster and Cayman models). A borescope check is not part of our inspection. If you are unsure of which particular model to buy, we are always willing to offer advice and guidance and may be able to point you in the direction of a company who specialises in suitable cars. Upon completion of the inspection we will call you to provide a brief rundown of the car’s general condition and report any important defects found. If you wish, the details of the inspection are not discussed with the seller. 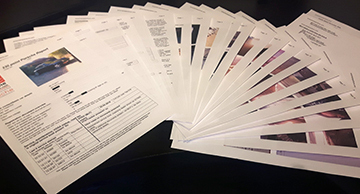 When back in the office a full report is compiled which is usually around 20 pages long & contains all of the bullet points, photographs of the good (and bad) issues found, plus an assessment of the service history. Also included is a visual report of the paint thickness and condition across the entire car. 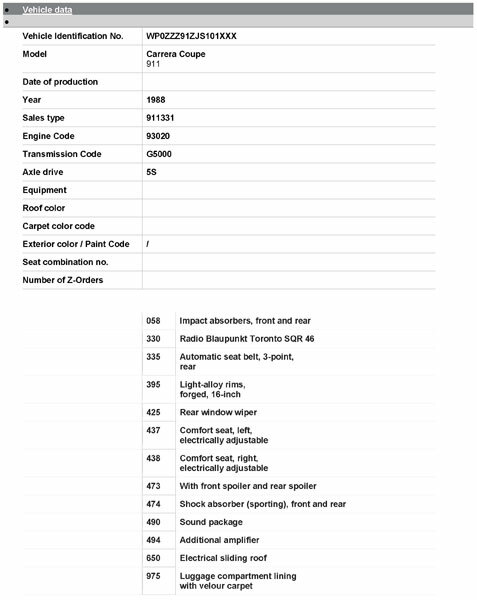 This is emailed to you as a PDF and benchmarks the quality of the car, hopefully saves you money in the negotiation process and helps you sell it at a later stage. This is usually sent out the same day, once digested we are happy to discuss the finer points. We also carry out a HPI data check that includes all the usual matching number information, plus checks on any insurance claims, finance owed and police records. The cost of this service is £410, the charges for bridge tolls, parking or entering any urban congestion zone will be added to this. This is an amazing report especially in the time. Thanks very much for your reactivity.